Cold-molding has been around since the development of good glues, mid-20th century, but it was the formulation of high-grade epoxy resins that allowed builders to construct stiff, lightweight, monocoque hulls that in many ways compete favorably with modern composites. If not as lightweight and strong as carbon fiber and other advanced cored composites, they are in many cases more aesthetically pleasing. In the 1970s the Gougeon Brothers published their book The Gougeon Brothers on Boatbuilding, in which they promoted wood-epoxy construction methods that produced boats like Golden Dazy, which won the Canada Cup, and Rogue Wave, the 60‘ (18.3m) trimaran campaigned by Phil Weld. Meade and Jan Gougeon performed many tests on various species of wood, confirming the exceptional physical properties that make oak, western red cedar, Sitka spruce, mahogany, and others attractive for boatbuilding. Since the advent of fiberglass in the 1950s it may have seemed that continuing wood boat construction would be confined to conventional plank on frame, of main interest to traditionalists, but cold-molding of wood materials asserts itself as a viable and modern process. Notable builders today employing cold-molding include builders of Carolina-style sportfishermen, where the conventional wisdom persists that a wood hull “fishes better” than one of fiberglass. Jarrett Bay of Beaufort, North Carolina, is a good example, and the Turkish builder Vicem Yachts (see PBB No. 102) is unusual in its cold-molding of high-end motoryachts. 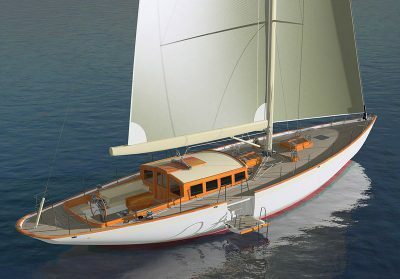 Anna was designed by Stephens Waring Yacht Design as a Spirit of Tradition yacht. In that emerging sailing yacht design genre, the visible portions—topsides and house—are defined as classic, derived from revered bygone aesthetics; and the underbody is modern, often with a fin keel and spade rudder. Add to the list Lyman-Morse of Thomaston, Maine, which is currently building a 65‘ (19.8m) custom sloop. Styled as a Spirit of Tradition yacht, Anna was designed by Paul Waring and Robert Stephens of Stephens Waring Yacht Design (Belfast, Maine), with interior styling by Martha Coolidge Design (also in Belfast). Lyman-Morse president Drew Lyman said they built a full-scale mock-up of the boat for the owner to consider various layouts. Veneers for the hull skin were specified in CAD, and CNC-cut for precise fit, making trimming unnecessary. Inner layers are Douglas-fir tongue-and-groove, while on the outside veneers are western red cedar oriented +/–45° and Douglas-fir finished with a layer of DBM 1808 fiberglass set in epoxy. Frames are also Douglas-fir. The interior of the hull will be left exposed. Deckbeams are Douglas-fir, and joinerwork will feature traditional raised and V-groove paneling with varnish and white paint. Lyman said there is virtually no metal in the boat, adding that a structural grid is made from composites. He said they have been working hard the last three to five years to get away from “stick-building” the interiors, relying more on Solidworks software for modeling, and their large table for CNC-cutting of parts, including bevels and scarfs, to assemble components outside the boat. Left—All the ergonomic features of the yacht were mocked up in plywood to ensure that spatial relationships were correct for the owners. Right—Over wet resin, precut veneers of Douglas-fir and western red cedar are fit diagonally to the upside-down hull. Left—Drew Lyman, president of Lyman-Morse and son of founder Cabot Lyman, stands inside the finished hull. The keel frame plate was infused with vinylester resin and E-glass, molded oversize and then CNC-cut to fit the tops of the keel frames and intercostals. It was then bonded to the tops of the framing network to better tie the structure together. Right—The transom was laminated with 10 layers of marine plywood and an outer layer of sapele, shaped to receive the roll of the hull planking and a precision pocket to accept the titanium backstay fitting. 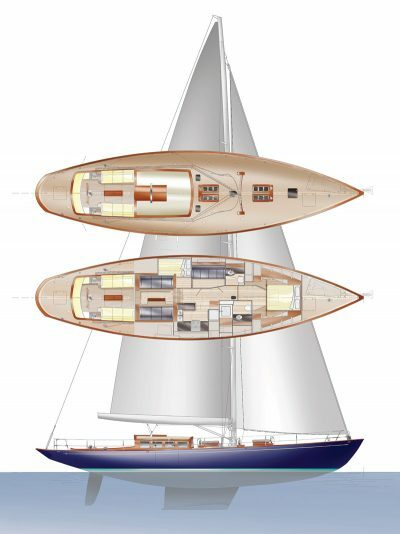 This rendering of Anna shows the unusual boarding feature worked into the starboard topsides. Unlike contemporary yachts with wide transoms suitable for “garages” and scoops to launch tenders, traditional counter transoms present boarding difficulties. When asked why cold-molding, as opposed to advanced cored composites, was selected for this project, Lyman said that from the get-go the client and his designers were keen on wood because they felt it was in keeping with the classic styling of the yacht. Not only were looks important, the boat’s light weight would make it competitive in classic yacht regattas in which they intend to compete. Lyman said his team was excited to take on a cold-molded project, perhaps because they haven’t done a lot of it in the past, citing the Rodger Martin–designed Gray Wolf and a number of 25‘ (7.6m) powerboats as previous projects utilizing this process. Principal specifications: LOA 65‘6“ (20m), LWL 47‘10“ (14.6m), beam 16‘10“ (5.1m), draft 8‘0“ (2.4m), displacement 57,000 lbs, (25,855 kg), sail area 2,000 sq ft (186m2). Lyman-Morse Boatbuilding, 84 Knox St., Thomaston, ME 04861 USA, tel. 207–354–6904, website www.lymanmorse.com.